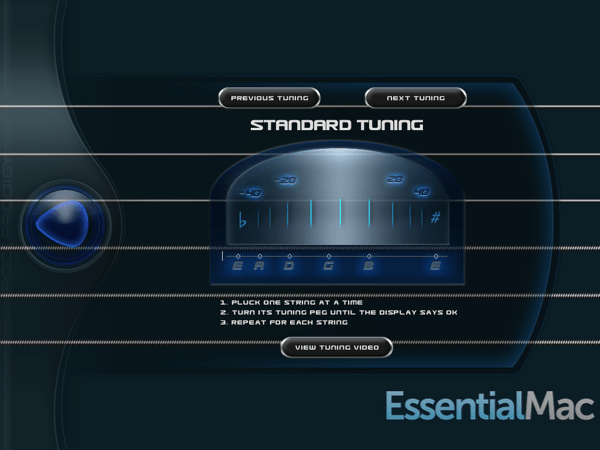 After installing the iPad application and connecting your guitar, step one is the issue of tuning. Not a problem with the built in tuner that supports standard tuning and other styles as you progress. Jumping into the quick start / lesson, a teacher’s voice will then start to guide you throughout the lessons. Just like Guitar Hero, you have to pluck the right note on the right string whilst keeping time. We used the Griffin Guitar Connect Cable for iPad, iPhone, iPod Touch cable for hooking up the guitar to the iPad. Those acoustic players won’t need a cable to get going. [pullquote_left]Better than paying for expensive guitar lessons when starting. [/pullquote_left]Having previously forked out quite a hefty sum of cash for guitar lessons in my past I actually felt I got more use out of the using Rock Prodigy on my iPad than shelling out the £20 for an hours guitar lesson covering the basics. Rock Prodigy goes through all the steps of holding the guitar, fret position and more to get you in a position to start making noise . The first few sample chapters quickly got me hooked enough to want to make progression onto some of the other tracks and courses. After lesson 2 was mastered the rhythm and pace of Rock Prodigy was lost for me. After the gentle yet progressive pacing of lesson 2, lesson 3 came as a bit of a shock. Suddenly we were told to go up and down the neck of the guitar with no prior warning or leading curve to get to this point. Different notes were being asked for, something not practiced before. This could be where the app is just a taster getting you to make in app purchases. The folks over at Rock Prodigy helped me out with this. Turns out that I’d confused Lesson 3 with an actual demo song “The Road” Whoops. As they pointed out if you goto the store (free sign up) Lesson 03 – Basic Fretting Part 1 walks you through the first 8 frets on the low E string. It’s a FREE downloadable lesson found in the PR “Store” (Tap store button, then free button). You will be asked to create a free RP account so your purchases can be stored in the cloud. Thanks for getting back to me on this error on My part. 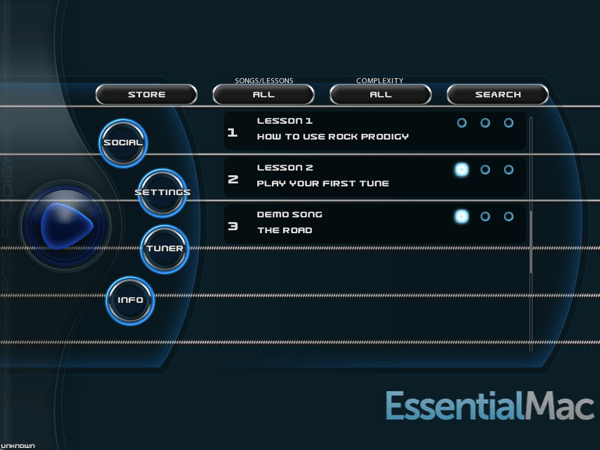 In app purchases consist of songs of various levels from beginners to rock prodigy. 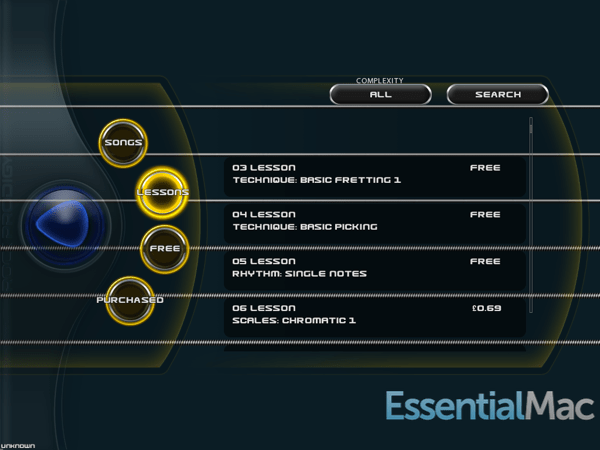 Once you get familiar with the app layout you can access more free lessons in the store. At the moment there are 3 extra lessons you can download at no extra cost. If like me you are hooked then shelling out 69p for another lesson is nothing when you compare your progress to say paying an expensive guitar tutor. The lessons are informative, explaining the finer points like the beats and number of notes per bar etc yet done in a way which makes sense. Where was this app back in my school days. Right now I’m going through power cords and even at this early stage I’ve a hankering to turn my amp up to 11. Yet another feature is the baked in connection to Apple’s Game Center adding to the feel of a game which like any high score set on a traditional game, bates you into trying harder to beat it the next time around. Rock Prodigy Guitar is a free download for the moment however it will change to a paid app VERY soon. If you have the remotest interest in wanting to play the guitar this one is a keeper. Rock Prodigy is available from the App Store for iPad and for iPhone. As you can probably guess from this review, I’m dead keen on this app. My old and somewhat cheap guitar has been dusted off for the first time in over a year. The beginning lessons hook you in giving you an immediate sense of accomplishment. Lessons are well paced with no scarey or radical jumps in skill levels. Those who are more advanced will still find usage in the app as the catalog of songs to play to with the Tabs is growing in effect giving you your own backing track or group. The lessons can be played at half speed if you’re having trouble. You can even pause it and practice the bit giving you problems. So I don’t understand your reaction — it’s a lesson, practice. Diane, the confusion comes from the main screen going 1, 2, 3 and I assumed (wrongly) that the Demo song being after lesson 2 was sort of like lesson 3 in the organization of things. See the 2nd big picture in the post. Review has been updated to reflect this as well.